Kanagawa had been specified in 1858 as the third Treaty port to open in 1859. But it lay on the Tokaido, the main traffic artery between Edo and Kyoto, and the Japanese ‘looked for a means of keeping foreign merchants not only out of harm’s way but also out of their own way’ (as Hugh Cortazzi put it in his Victorians in Japan, 1987). They nudged the setting-out of the foreign settlement a few miles south-west on to land reclaimed from a swamp near the fishing village of Yokohama, below the huge rock outcrop that came to be known as The Bluff. Alcock was furious at being outmanoeuvred, and the consulate was known as the British Consulate, Kanagawa for the next twenty years. A site at Government Property Lot 155 Yamashita-cho was leased in 1863 and the first consulate was built there. It did not last for long. The great fire which raged through Yokohama on 26 November 1866 razed it, and over a quarter of the foreign settlement, to the ground. An additional site was leased in 1866 at Lots 172 and 173 and a new consulate was built on it and occupied in 1870. It was a timber framed and stone-faced building, calculated as the best means of defeating both earthquake and fire. No drawings have been found of this building, but Boyce described it in 1899 as sturdy as any of its age in Yokohama and decided not to recommend its rebuilding. 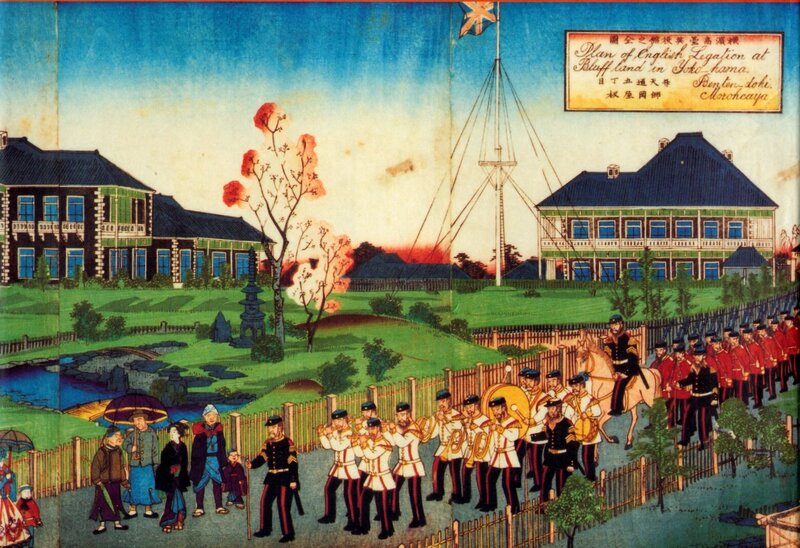 In 1879 the Admiralty also acquired leases for a naval hospital and depot in Yokohama. The original consular site at Lot 155 was redeveloped with a gaol, which in due course proved too large and an embarrassment. In 1920, this Lot was part-exchanged with a Mrs Abegg of Zurich for the lease of 18 The Bluff, a good property comprising both a large and a small house which adapted well to the residential needs of the consul-general and vice-consul – who moved into them. But, once again, not for long. The Great Kanto earthquake of 1 September 1923, followed by an immense fire, destroyed practically all of the buildings in Yokohama, including those of the consulate and the Admiralty. The consulate rented accommodation for one month aboard a steamer in the harbour while a flimsy single-storey hut, with thin timber boarding externally and tarred paper internally and a corrugated iron roof, was erected for the offices on the devastated site. This building, although it was propped up and tied down in 1926, had to suffice until 1930. The staff moved into whatever rentable residential premises they could find, including on board ships chartered to lie at Yokohama, and remained peripatetic for the next fifteen years. The official re-planning and re-building of Yokohama obviously had a bearing on the development of the consulate and Admiralty sites. From 1924, a deal slowly took shape with the Japanese Government that met the needs both of the consulate-general for a new office and residence and of the Japanese zoning and road-building requirements. The Admiralty no longer required its sites but the Foreign Office managed to persuade it not to mention that to the Japanese. The British were in rather a weak position because none of their tenures were stronger than perpetual leases for specified purposes. A deal was eventually signed early in 1930. The British bought the freehold of about a quarter of the Naval Hospital site (on which to construct two houses for the consul-general and vice-consul) and about two thirds of the offices site (on which to rebuild consulate offices). In exchange, the British ceded the rest of the Naval Hospital site, the Depot site, 18 The Bluff, and about one third of the offices site (plus a strip of land along the north end of the Tokyo compound that the Japanese were anxious to have). It was a very lopsided deal in terms of area but the British nevertheless emerged with good sites with firm tenures on which to build new offices and residence. 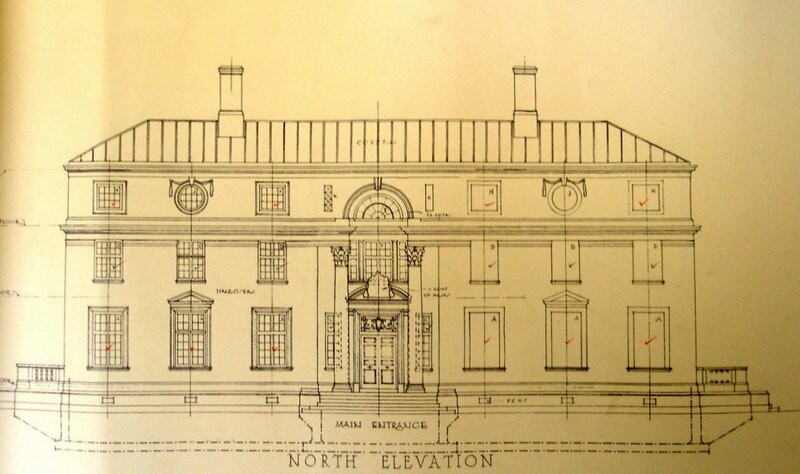 Designs for a new office building, with two flats above, were started by the Office of Works in London in 1927 and discussed with the consul-general while on leave that summer. JC Wynnes, an assistant architect, took them with him to Tokyo when he was posted there in early1928 to supervise the rebuilding of the Tokyo compound. He developed them further with the consul-general during the following year. Construction could not start before the overall sites exchange agreement was signed in early 1930, but got under way in August 1930 when the contract was let to Showa Doboku Kenchibu Kaisha Ltd, in the sum of 72,750 yen. The contract appears to have been straightforward and the building was formally opened on 24 November 1931. Besides hosting the British consulate, Yokohama was the main home of the British legation for thirteen years after most of it withdrew from Tokyo in 1861. Although some staff lived in Tokyo in the quieter times, and Parkes himself was travelling between the two cities several times each week, most of the staff lived and most of the legation’s work was done in Yokohama. For this purpose, two houses were rented in 1862. One of them, ‘a rather rickety but comfortable bungalow on the bund’ was used for both offices and some staff quarters. It survived the 1866 fire but not another fire the following year, after which its site was taken over for the construction of the Grand Hotel. In 1866, Parkes rented a residence for himself and his family: other legation staff lived in rented houses in the town. In the mid-1860s, Parkes began a campaign to persuade the Japanese that it was their duty to ‘… erect at Yokohama a range of buildings sufficient for the accommodation of the whole Legation at a cost not to exceed sixty thousand dollars, and to let these buildings to the British Government for such time as the latter might require, at a rental of ten percent upon the outlay’. The buildings to be provided would be on The Bluff, were to be built to foreign specifications, and Parkes undertook to supply the plans himself. They were prepared by an American architect who had recently come to practice in Japan, RP Bridgens, and envisaged an extensive complex. Major William Crossman, from Shanghai, pared the proposals down and they were ready for occupation by midsummer 1867. The buildings were clearly a fine pair of houses, but they were soon under-used as work migrated to Tokyo. The legation left Yokohama for good in April 1875, and the buildings on The Bluff returned to the Japanese authorities [and were ? destroyed in the 1923 earthquake]. 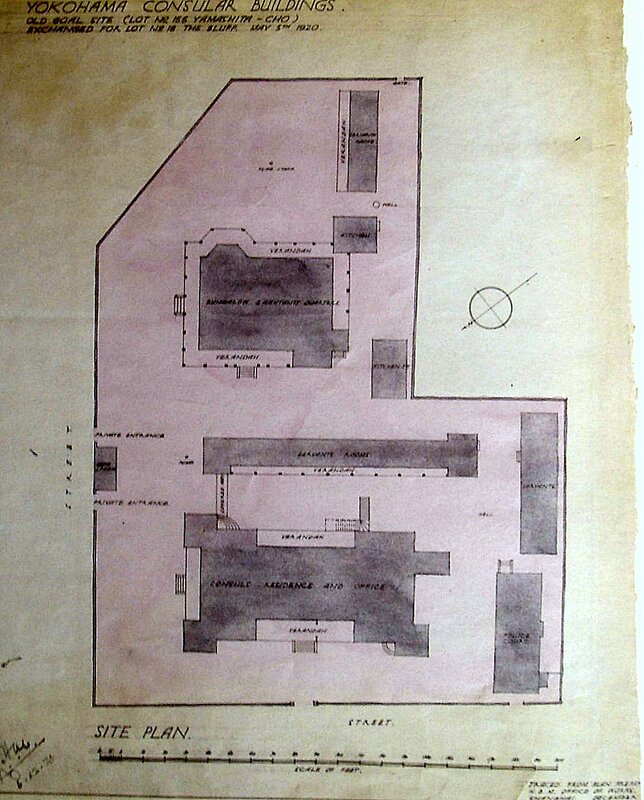 Plan of consular site at Lot 155 Yamachito-cho, showing offices and staff quarters destroyed in 1866. 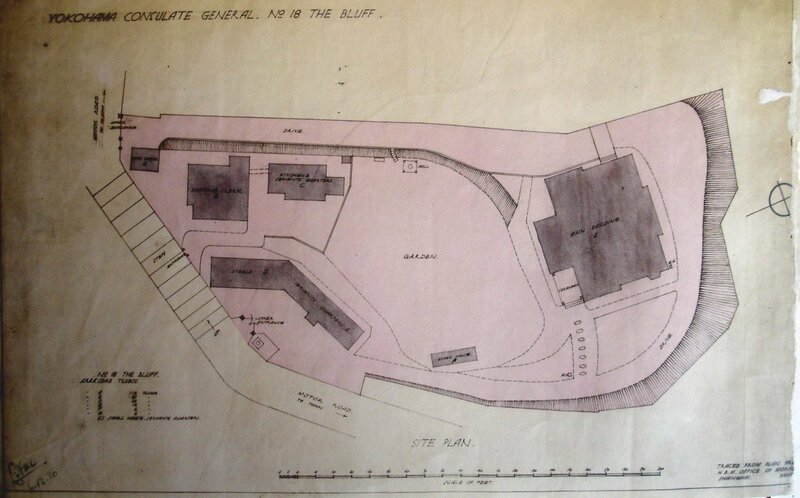 Site later used for the gaol, and exchanged in 1920 for 18 The Bluff. Offices (on ground floor) and assistants’ quarters above at Lots 172-3 Yamashita-cho, built 1870, and destroyed 1923. 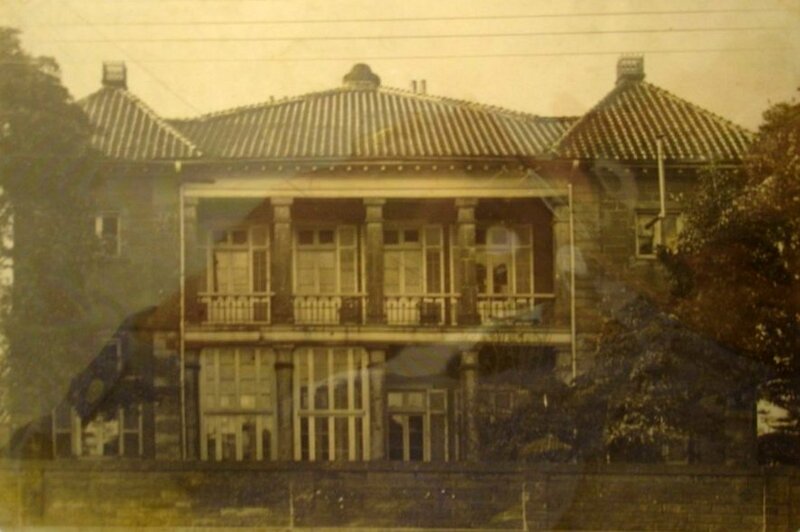 The property at 18 The Bluff, acquired in exchange for Lot 155 of Yamashita-cho, and which became the consul-general’s residence in 1920. 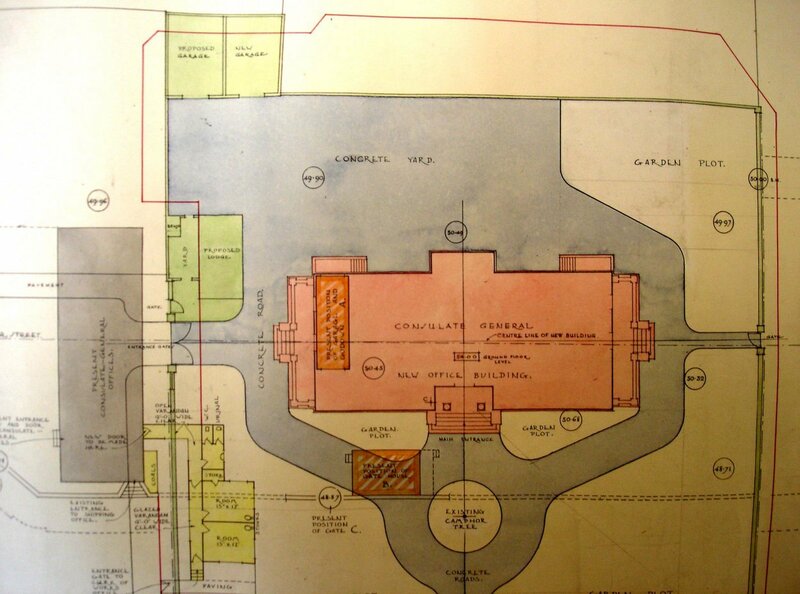 1930 layout of new consulate-general offices on most of the Lots 172-3 Yamashita-cho site. 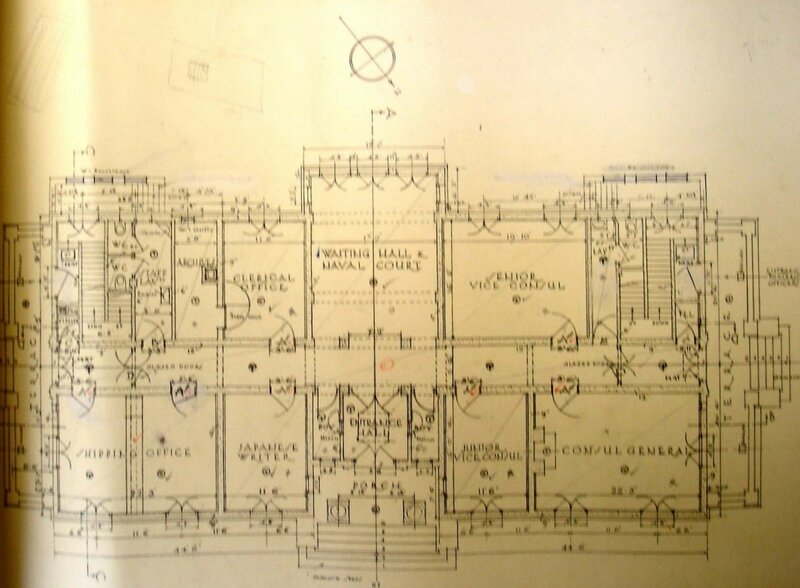 Ground floor plan of new consulate-general building, 1930. 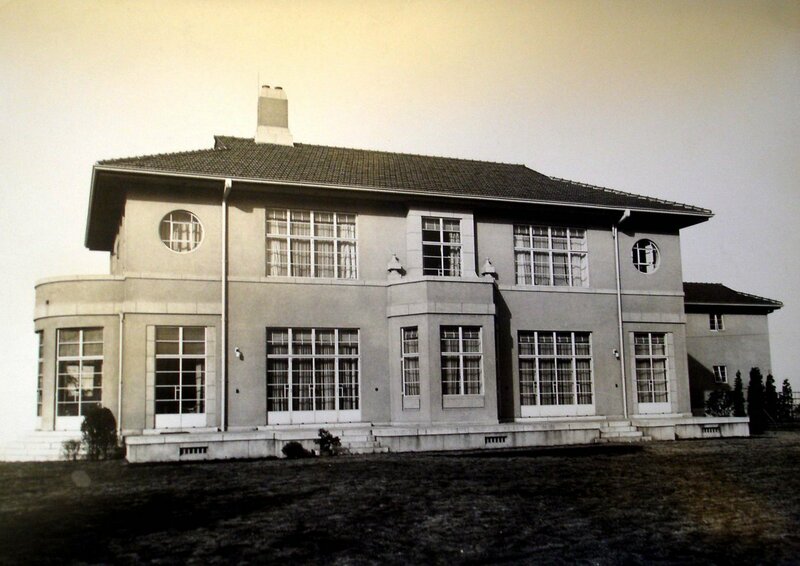 Front elevation of new consulate-general building, 1930. 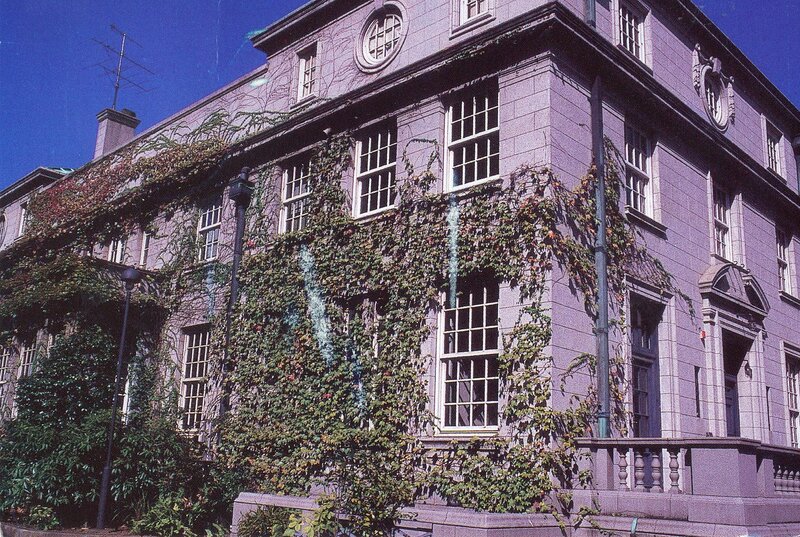 The 1930 consulate-general building is today occupied by the Yokohama Archives of History. 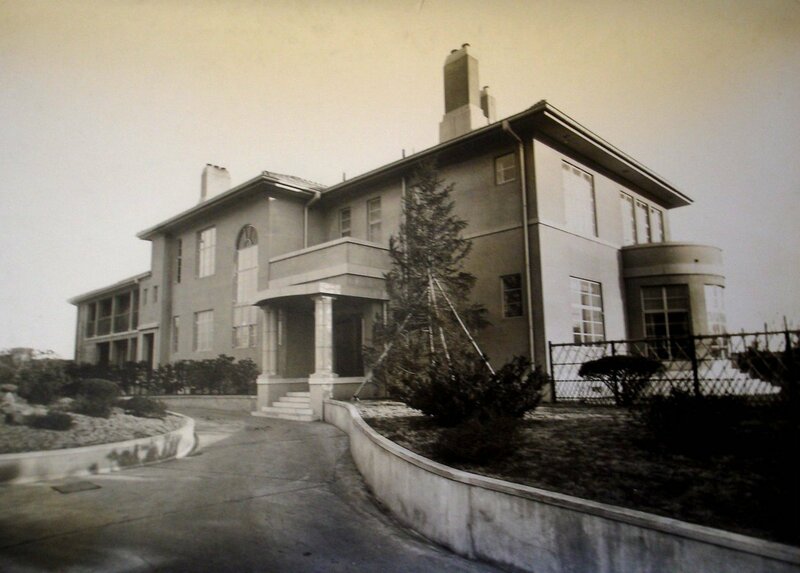 Entrance front of new consulate-general residence on completion in 1939. The site was part of the former Naval Hospital. The garden front of the new residence in 1939. 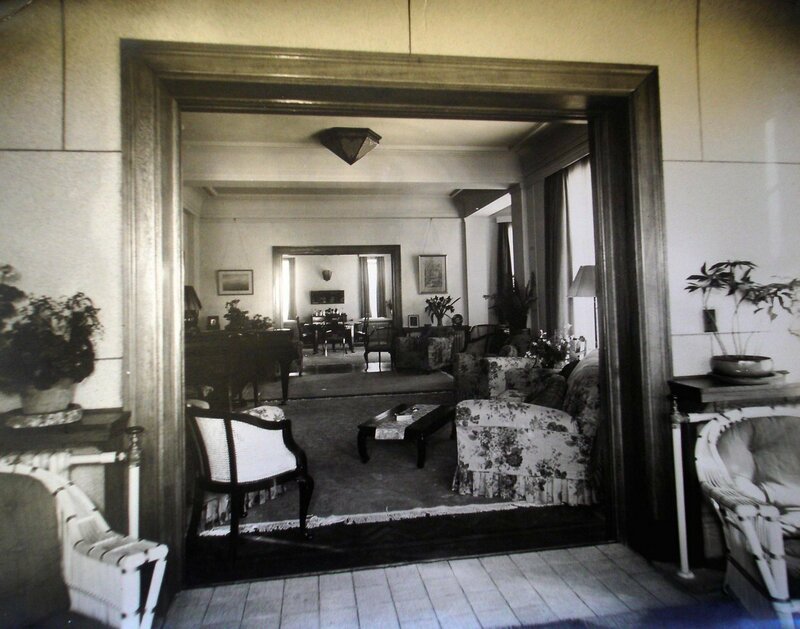 The reception rooms of the new residence, 1939.